If I were to pick a short story collection that I have thoroughly enjoyed, then I would pick this one. I never picked up an Isiguro book before. I guess this is my first introduction to the novelist, and somehow, I like the fact that I picked it up. In fact, I liked it enough that I was able to finish the book within a day. So, what is this book about? 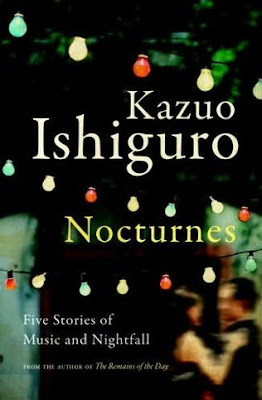 This book, as the subtitle says, is a book containing five stories of music and nightfall. I find it amazing that a writer was able to pick such a topic as a nocturne and write five related stories about it. And come to think of it, these five short stories indeed feel like the literary equivalent of a musical nocturne. I have played several nocturnes in a past life, when I was playing Chopin and Faure, and playing those nocturnes just gave me this melancholy and pensive feeling upon hearing the dreamy music. These stories are just the same. The stories look like they are unfinished yet interwoven stories to each other. The first and fourth story shared the same characters, while the second and fourth story had a rather comic take to them. The first and fifth stories on the other hand both involved scenes in a cafe or a piazza, somewhere in Italy. Finishing every story just gave me this pensive and melancholy mood that always followed whenever I would hear or play a nocturne, and after that, I would always want another one. I guess I couldn't find anything bad about this book. And so for that, I am glad that I decided to try Ishiguro. I never had the courage to read Japanese writers, for some unexplainable reason. I thought that they were too dense or complicated, and given my experience in studying Japanese literature back when I was a student in Japan, I never got them. So I thought they would be a hard read. And only recently have I learned that Ishiguro is actually a British writer, and that his writing cannot be categorized in the same way as other Japanese writers. I guess that made sense after reading this book. I am glad. I am giving it 5 out of 5 stars. No problem. This is a great read. Just a minor point, but this is not a novel, but a short story collection. Nevertheless, I think you will enjoy this one.